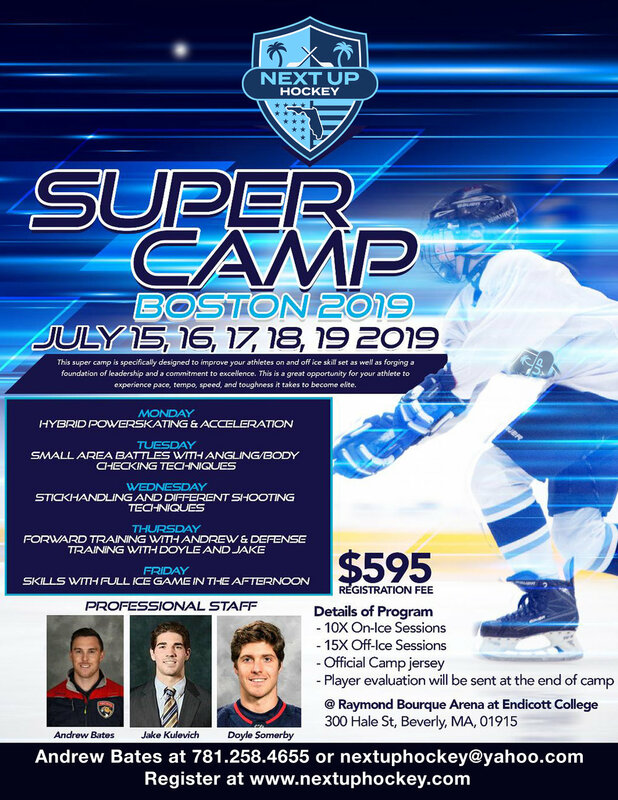 This super camp is specifically designed to improve your athletes on and off ice skill set as well as forging a foundation of leadership and commitment to excellence. This is a great opportunity for your athlete to experience pace, tempo, speed, and toughness it takes to become elite. We study the game today and teach modern techniques, and off-ice agility training and conditioning geared toward building the quickness and endurance needed to become elite. In addition to our two on-ice sessions, two off-ice sessions, daily chalk talk will help your athlete become a better student of the game so they can apply the skills learned into their game. All campers will participate in dry land training focusing on explosiveness. Signed National and International Professional Contracts, NCAA College Hockey Captain, Worcester, Worcester Leading Goal Scorer, MASCAC All-Conference, Worcester Cup MVP, MASCAC All-Academic Team, Played Jr. A in AJHL, Boston Bulldogs, New England Prep Small School Champion, Kimball Union Academy, Leading Goal Scorer, St. Mary’s Lynn, Leading Goal Scorer, Marblehead, Massachusetts High School Hockey North State Champion, Marblehead. Four-Year Starter, and Three-Year All-Conference player. Tallied 90 points on 44 goals and 45 assists in his high school career. AHL Cleveland Monsters, NCAA College Hockey Captain, Boston University, Helped BU to National Title Appearance, Hockey-East Title, Two-Time Hockey East Top Performer, Played 10 games in USHL, Muskegon, Drafted by New York Islanders in 2011, 5th round, (125th Overall), New England Prep Captain, Kimball Union Academy, Led Kimball Union to a #1 ranking, Top- Scoring Defenseman at KUA, Played at St. Mary’s Lynn, Led SMH to a Division 1 North Final, Played as a 8th grader with Andrew at St. Mary’s Lynn. Tallied 43 points on 7 goals and 36 assists in his career at Kimball Union Academy. AHL Bakersfield Condors, AHL Manitoba Moose, NCAA College Hockey Captain, Colgate, ECAC All-Conference, ECAC All-Academic Team, Played Jr. A in EJHL, South Shore Kings, EJHL All-Star, New England Prep, Berkshire, New England Prep Large School Champion, Massachusetts High School Hockey State Champion, Marblehead, Team Captain, Three-Year All-Conference player, NEC Most Valuable Player, Marblehead, Played with Andrew as a member of the 2008 Marblehead North Championship Team. Tallied 86 points on 29 goals and 57 assists in his career at Marblehead.